What are the misspellings for discussion? What are the common mistypes for discussion? 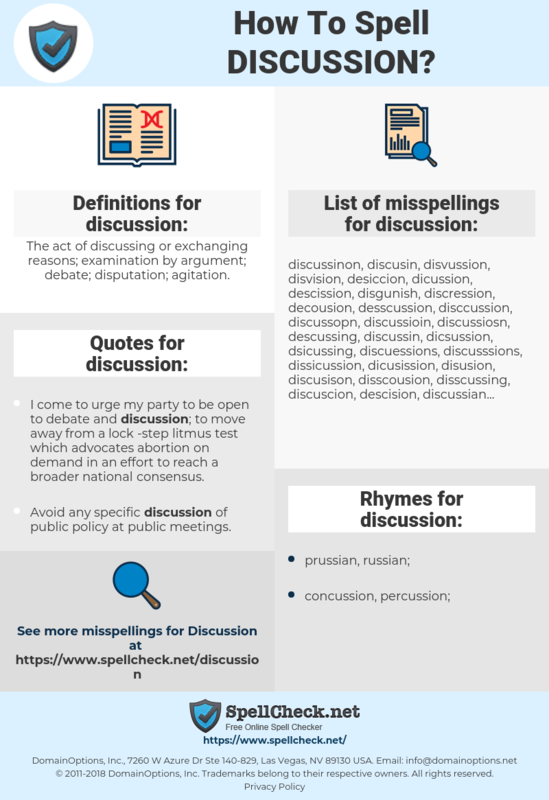 What is the definition of discussion? What are the quotes for discussion? What are the rhymes for discussion? What are the translations for discussion? What are the common typos for discussion? 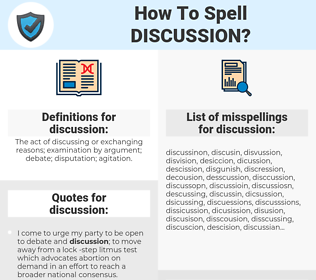 The act of discussing or exchanging reasons; examination by argument; debate; disputation; agitation. This graph shows how "discussion" have occurred between 1800 and 2008 in a corpus of English books. I come to urge my party to be open to debate and discussion; to move away from a lock -step litmus test which advocates abortion on demand in an effort to reach a broader national consensus. 讨論, 研讨, 商讨, 商议, 议论, 交谈, 对谈, 丛谈. gesprek, bespreking, discussie, dialoog, overleg, gedachtewisseling. Besprechung, Beratung, Unterhaltung, Konferenz, Auseinandersetzung, Diskussion, Gespräch, Debatte, Analyse, Unterredung, Aussprache, Durchsprache.